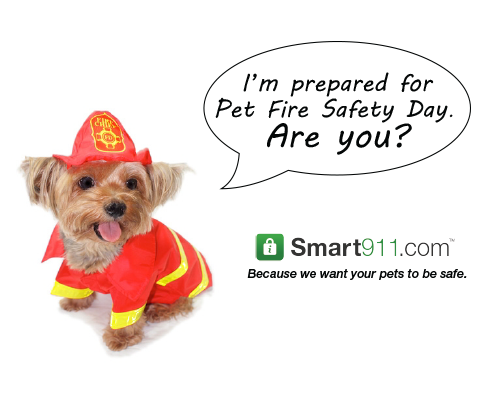 July 15 is Pet Fire Safety Day. Each year an estimated 500,000 pets are affected by home fires, and nearly 1,000 house fires are accidentally started by the homeowner's pet. We often think about keeping our pets safe in the event of a fire, but we may not always think that they could also be the cause. The National Volunteer Fire Council has offered some safety tips for prevention of fires from pets. Extinguish open flames - Pets are generally curious and will investigate cooking appliances, candles or even a fire in your fireplace. 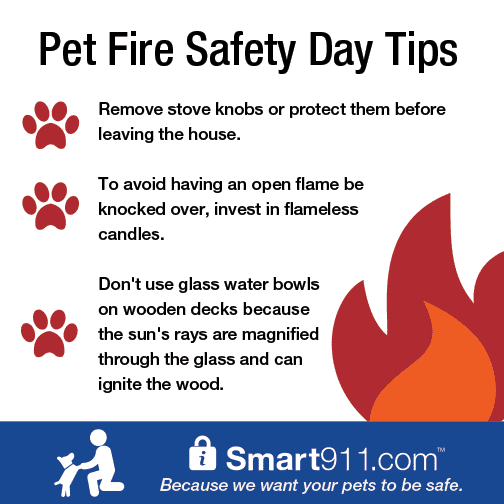 Ensure your pet is not left unattended around an open flame and make sure to thoroughly extinguish any open flame before leaving your home. them with covers before leaving the house. A stove or cook top is the number one piece of equipment involved in your pet starting a fire. Invest in flameless candles – These candles contain a light bulb rather than an open flame, and take the danger out of your pet knocking over a candle. 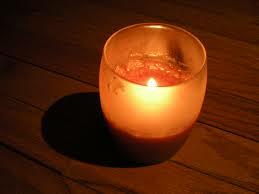 Cats are notorious for starting fires when their tails turn over lit candles. Beware of water bowls on wooden decks – Do not leave a glass water bowl for your pet outside on a wooden deck. When filtered through the glass and water, the sun’s rays can actually heat up and ignite the wooden deck beneath it. Choose stainless steel or ceramic bowls instead. 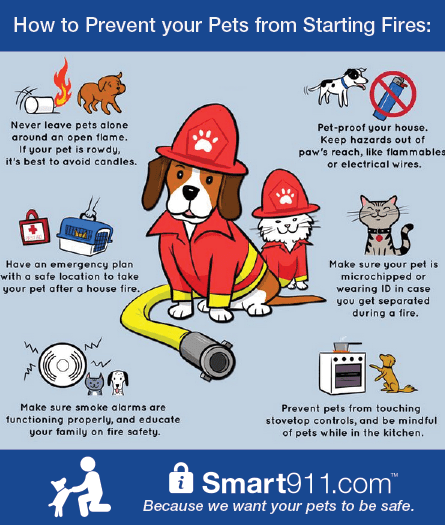 Pet proof the home - Take a walk around your home and look for areas where pets might start fires inadvertently, such as loose wires and other potential hazards. Keep pets near entrances when away from home – When leaving pets home alone, keep them in areas or rooms near entrances where firefighters can easily find them. Secure young pets - Especially with young puppies, keep them confined away from potential fire-starting hazards when you are away from home, such as in crates or behind baby gates in secure areas. Practice escape routes with pets – Keep collars and leashes easily accessible in case you have to evacuate quickly with your pet or firefighters need to rescue your pet. Consider using monitored smoke detection services – As an added layer of protection beyond battery-operated smoke alarms, smoke detectors connected to a monitoring center help save pets who can’t escape when left home alone. Affix a pet alert window cling – Write down the number of pets inside your house and attach the static cling to a front window. This critical information saves rescuers time when locating your pets. Make sure to keep the number of pets listed on them updated. 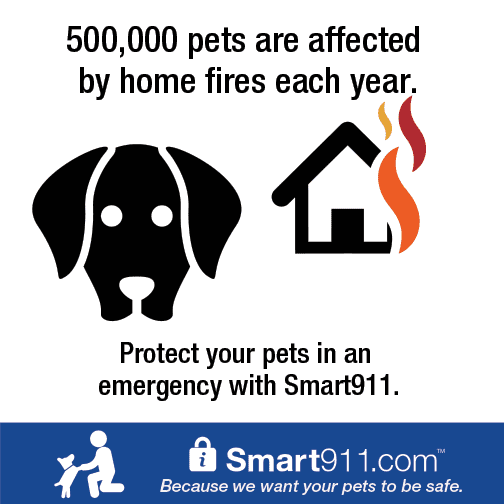 Remember to always list your pets in your Smart911 Safety Profile. 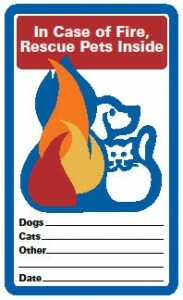 In the event of a fire or other emergency, responders will know how many pets are in the home and their names to help get them to safety quickly. Share the below graphics to help others keep their pets protected from a fire emergency. Smart911 holds U.S. Patents – 6,600,812; 8,484,352; 8,516,122; 9,078,092; Patents Pending.